Wouter Beukema (2013): Blanus mettetali Bons, 1963. En: Martínez, G., León, R., Jiménez-Robles, O., González De la Vega, J. P., Gabari, V., Rebollo, B., Sánchez-Tójar, A., Fernández-Cardenete, J. R., Gállego, J. (Eds.). Moroccoherps. Anfibios y Reptiles de Marruecos y Sahara Occidental. Disponible en www.moroccoherps.com/ficha/Blanus_mettetali/. Versión 18/01/2013. Consulta realizada el 25 de abril de 2019. Français: Amphisbène Cendré Du Maroc. Área de distribución mundial de Blanus mettetali según la IUCN. Bons (1963) described the subspecies Blanus cinereus mettetali based on material originating from central-western Morocco. According to the original description, B. c. mettetali was partitioned from the nominate subspecies based on differences in scalation. Busack (1988) subsequently compared Spanish and north Moroccan specimens of Blanus by means of electrophoretic analyses and morphological data. This led to the description of Blanus tingitanus and simultaneous elevation of B. c. mettetali to species rank. Busack (1988) however did not include B. mettetali in his electrophoretic analyses, while morphological analysis was based on existing museum specimens. The proposed differentiation between B. mettetali and B. tingitanus conclusively remained solely corroborated on morphological data. In a phylogeographical study on Moroccan Blanus nearly two decades later, Vasconcelos et al. (2006) failed to include samples of B. mettetali, likely due to a continuing lack of available material. Albert et al. (2007) were the first to include a single sample of B. mettetali from Rabat in their mitochondrial and nuclear DNA analyses. This study showed that separation between B. tingitanus and B. mettetali most likely took place between 5.5 and 5 million years ago, confirming their status as separate species. 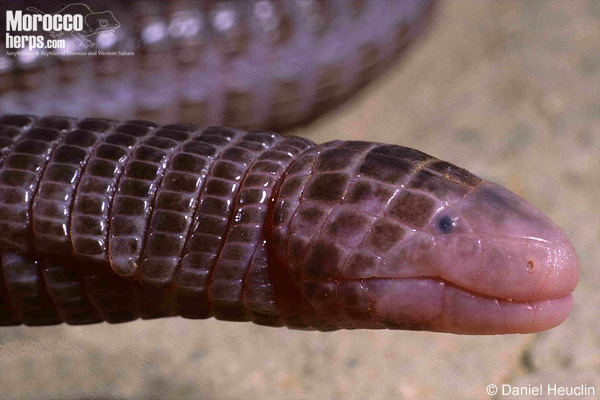 Blanus mettetali is a small, legless fossorial lizard species. Recorded snout vent lengths range between 90–230 mm while head length varies between 4–7 mm (Werner, 1931; Busack, 1988). The tail is short and ends in a sharp point. Eyes are covered by transparent scales. Members of the genus Blanus are morphologically conservative. This fact, in combination with a relative low amount of comparative material has not resulted in the recognition of any differences in size between Moroccan species of Blanus. However, B. mettetali can be distinguished from B. tingitanus by a higher amount of preanal pores; 8-10 (see also Boettger, 1883) in the former, in contrast to 5 or 6 in the latter. Blanus_mettetali. Morocco. Photo: © Wouter Beukema. Blanus_mettetali. Agadir. Photo: © Daniel Heuclin. Dorsal colouration varies from bright pink in juvenile individuals to dark purple or brown in older specimens. The centre of each scale is darker coloured as a result of increased pigment density, apart from the snout, which appears white or cream-coloured. Life-history knowledge of B. mettetali is extremely limited, as a result of the small amount of encountered individuals and their fossorial or occasionally nocturnal habits (Bons & Geniez, 1996). Several individuals have been found under stones near ruins (Bons & Bons, 1959; Stemmler, 1972). Blanus mettetali is presumably most easy to observe during the humid winter and spring, when individuals can be encountered under stones or migrate above-ground during the night. The vast majority of lowland records accompanied by a either a date or month comprise encounters in March or April (e.g. Boettger, 1883; Hediger, 1935; Bons & Bons, 1959; but see Stemmler, 1972 for a record from July). Werner (1931) found a single individual in June at 1200 m. a.s.l. 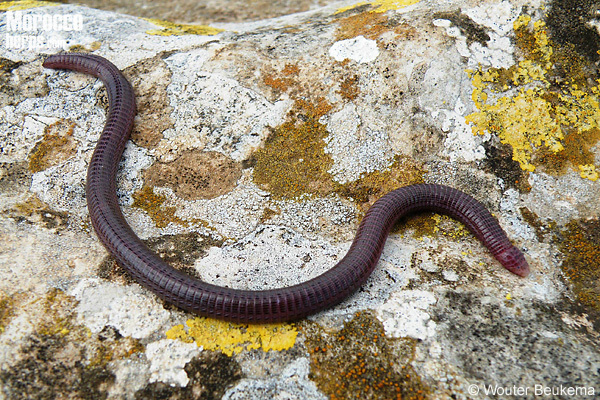 Individuals likely hide deep in the soil during the arid summer and autumn. Nothing is known about the reproduction or behaviour of B. mettetali. 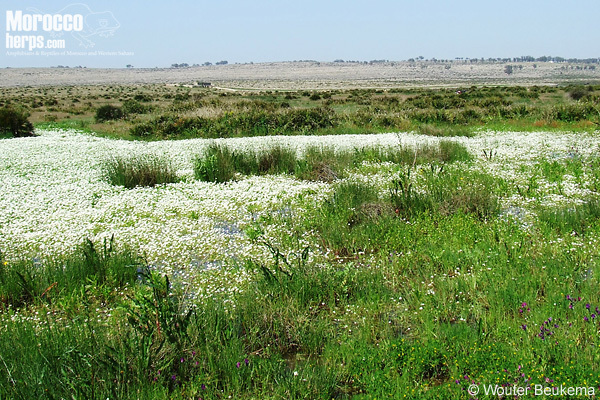 Blanus mettetali is endemic to Morocco, where it occurs southwards from Rabat (possibly from the Oued Sebou, Busack 1988) between the Atlantic Coast and the High Atlas Mountains. 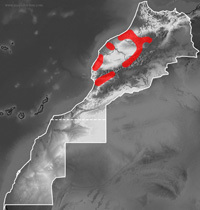 The southern limit of its distribution comprises the Souss Valley. The distribution of B. mettetali in the Plain of Marrakesh seems to be highly restricted (Roux & Slimani, 1992). Bons & Geniez (1996) listed only about 30 localities for B. mettetali; this number barely increased during recent decades, as can be concluded from multiple studies dealing with the distribution of Moroccan herpetofauna (e.g. Pieh, 2006; Harris et al., 2008; 2010; Barnestein et al., 2010; 2012). Occasionally just a single individual was encountered, while most studies produced no new records. Indeed, records from historical studies are without exception based on just a single individual (e.g. Werner, 1931; Hediger, 1935; Bons & Bons, 1959; Stemmler, 1972). Doukkala plain, interspersed with small water bodies and many stones. Morocco. Photo: © Wouter Beukema. Structure-rich habitat of B mettetali in the Doukkala. Morocco. Photo: © Wouter Beukema. Blanus mettetali is most generally found in open to half-open humid structure-rich habitats, characterized by an abundance of stones. 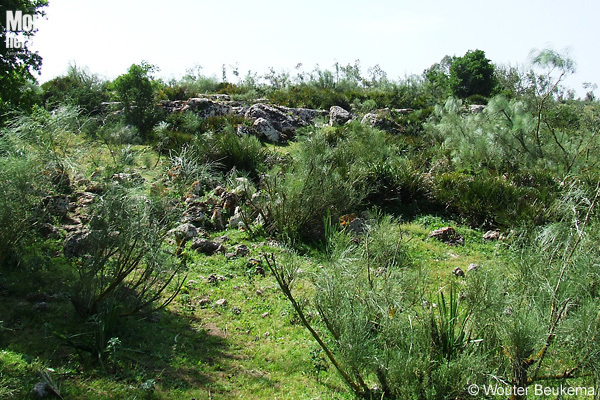 On the Doukkala Plain, B. mettetali was encountered under stones close to ponds or flooded fields characterized by a rich herbaceous layer, during late March. General abundance seems low, especially when compared to B. tingitanus of Iberian species of the same genus (Pers. obs.). Members of the genus Blanus generally favour humid circumstances and/or relatively loose soils as part of their microhabitat. While such conditions are common in northern Morocco and the northern Middle Atlas where B. tingitanus is readily found, these are much rarer in central- and southern Morocco. The Plain of Marrakesh and the Souss Valley suffer from increasing aridity, not in the least place due to agricultural practises. These actions could well represent a significant threat to persistence of lowland B. mettetali populations (Miras et al., 2006). 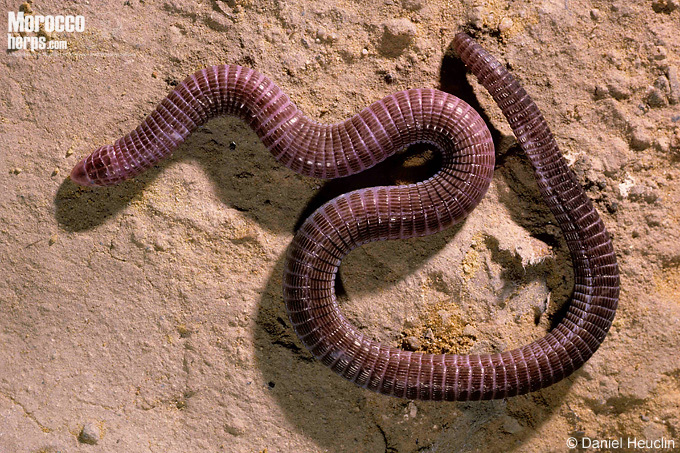 The only other amphisbenid with which this species co-occurs, Trogonophis wiegmanni, is better adapted to arid conditions and conclusively much more abundant when both species occur syntoptic (Bons & Bons, 1959; Roux & Slimani 1992; Pers. obs.). However, it is likely that B. mettetali is locally abundant on the remote, largely unsurveyed western slopes of the High Atlas Mountains. Albert, E.M., Zardoya. R. &García-París, M. 2007. Phylogeographical and speciation patterns in subterranean worm lizards of the genus Blanus (Amphisbaenia: Blanidae). Molecular Ecology 16: 1519-1531. Barnestein, J.A.M., González de la Vega, J.P., Jiménez-Cazalla, F. & Gabari-Boa, V. 2010. Contribución al atlas de la herpetofauna de Marruecos. Boletín de la Asociación Herpetológica Española 21: 76-82. Barnestein, J.A.M., García-Cardenete, L., Jiménez-Cazalla, F., Valdeón, A., Escoriza, E., Martínez, G., Benavides, J., Esteban, J.L., Fuentes, J., Ramírez, A., Álvarez, J. & Jaén-Velázquez, I. 2012. Nuevas localidades de Myriopholis algeriensis y Lamprophis fuliginosus, y otras citas herpetológicas, en Marruecos. Boletín de la Asociación Herpetológica Española 23: 1-16. Bons, J. & Bons, N. 1959. Sur la faune herpétologique des Doukkala. Bulletin des Société des Sciences Naturelles et Physiques du Maroc 39: 117-128. Bons, J. & Geniez, P. 1996. Amphibienset reptiles du Maroc (Sahara Occidental compris). Atlas Biogéographique. Asociación Herpetológica Española, Barcelona. 319 pp. Busack, S.D. 1988. Biochemical and morphological differentiation in Spanish and Moroccan populations of Blanus and the description of a new species from Northern Morocco. Copeia 1: 101-109. Hediger, H. 1935. Herpetologische Beobachtungen in Marokko. Verhandlungen der Naturforschenden Gesellschaft in Basel 46: 30-31. Miras, J.A.M., Joger, U., Pleguezuelos, J. & Slimani, T. 2006. Blanus mettetali. In: IUCN 2012. IUCN Red List of Threatened Species.Version 2012.2. . Downloaded on 26 December 2012. Roux, P. & Slimani, T. 1992. Nouvelles données sur la repartition et l’écologie des reptiles du Maroc (la region de Marrakech: Haouz et Jebilet). Bulletin Institute Scientifique, Rabat 16: 122-131. Stemmler, O. 1972. Bericht über eine zweite herpetologische sammelreise nach Marokko im Juli und August 1970. Monitore Zoologico Italiano 6: 123-158. Vasconcelos, R., Carretero, M.A. & Harris, D.J. 2006. Phylogeography of the genus Blanus (worm lizards) in Iberia and Morocco based on mitochondrial and nuclear markers — preliminary analysis. Amphibia-Reptilia 27: 339-346.